Stamford International University Thailand (STIU) is an international university with several campuses in ASEAN including Thailand. Stamford College was established in Singapore and Malaysia in 1950. Subsequently a campus under the name of Stamford International College was opened in Thailand in 1995 as a joint venture with Fareast Stamford International Co. Ltd. While the institution was started with an English-based international curriculum, parallel courses in Thai language were introduced along the way. Credits can be transferred worldwide to (and from) colleges and universities at the undergraduate and postgraduate levels. The University established an academic collaboration agreement with Schiller International University of the United States in 2000 and was renamed to Schiller-Stamford International College (2 August, 2000) that year. Students at Stamford (Hua Hin), have an opportunity to study in any of the 8 campuses of Schiller in Europe and the United States, through programs offered under the students exchange agreement between the two Universities. STIU underwent several changes in its name in the process of evolving to a full-blown University – a status which was granted by the Ministry of University Affairs on 14 February, 2003, resulting in a renaming to Schiller-Stamford International University. 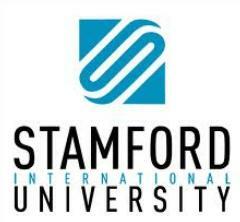 STIU finally achieved autonomy on 26 May, 2004 and was re-branded as Stamford International University. On 29 September 2008, STIU underwent an exhaustive re-branding – including the logo, the symbol, official colours, motto etc.